Twin skinned carcass manufactured in 9mm polypropylene. Sash in 6mm thick polycarbonate with full width aerodynamic finger grip. Counter balanced sash with twin stainless-steel cables running in pulleys for smooth movement. Electrical and mechanical services mounted on removable service plates for service and maintenance. Fume cupboards are both pre-wired and pre-plumbed to ensure minimum site installation time. Water front controls & outlets, i.e. cold water, hot water, steam. Gas front controls & outlets, i.e. nitrogen, compressed air, natural gas, vacuum, hydrogen. Electrical socket outlets, i.e. single, double, RCD protected, spark proof. Polypropylene (steel reinforced) support frames. Infill panels to ceiling height with by-pass grilles. For general laboratory use. For mounting on support frames or customer’s own bench/worktop. 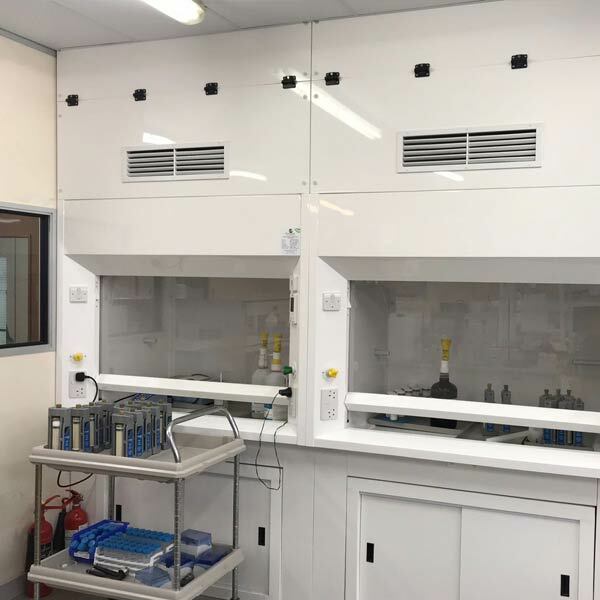 Bespoke fume cupboards can be manufactured to clients’ own dimensional requirements including extra width, depth and internal height.